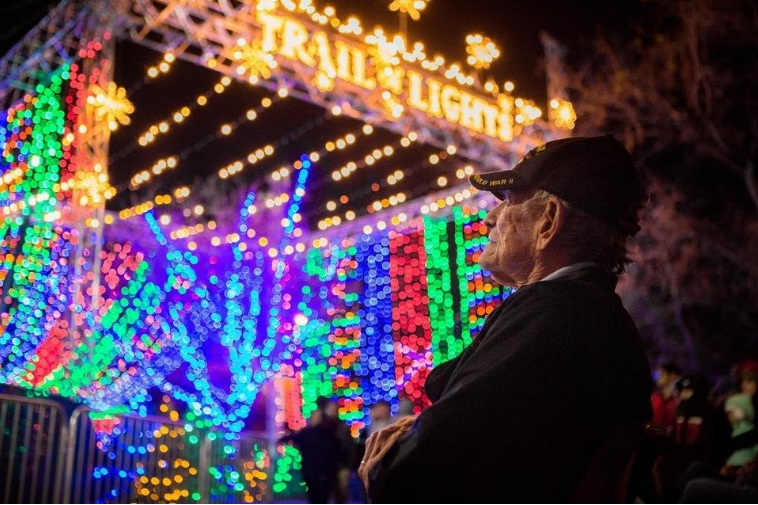 Austin’s quintessential holiday spectacular, the 54th Trail of Lights, returns on Dec. 10 with all the festive decorations and lights that we’ve come to expect. But what’s new this year? Here’s what you should know. At Zilker Park, Trail of Lights — featuring more than 2 million lights, more than 65 displays, 30 food trucks, nightly live entertainment and more — has never-before-seen displays. These “include a 13-foot illuminated carriage, 12 seven-foot lighted guitars commemorating Austin’s musical roots, a 25-foot spiral holiday tree” and an installation called Flipped, “an upside down tree grove highlighting local Austin businesses that we know and love,” according to a news release. In addition to the grand opening of the trail on Dec. 10, which will have free admission, keep these dates in mind if you want to participate in all of the festive fun. Dec. 1: The Trail of Lights Fun Run. The 2.1 mile course starts at the Zilker tree and takes you and the other thousands of participating runners through the glittery sights of the Trail of Lights. At the end is the Finish Line Festival and Expo with DJ beats, food trucks, drinks, a fitness expo and more. Dec. 8: The 5th annual Night Lights preview party. At the fundraising event, listen to live music from Brownout and Interrobang while enjoying bites from various local restaurants, including Darcy’s Donkey, Max’s Wine Dive and Quality Seafood Market, and drink tastings from Still Austin Whiskey Co., Kimo Sabe Mezcal, Austin Eastciders and more beverage brands. Tickets sales go toward the Trail of Lights Foundation, the organization in charge of producing the holiday event each year. After Dec. 10, seven of the 14 nights when Trail of Lights will dazzle Zilker Park are also free. On those nights when it’s not, there are both ZIP Fast Passes and platinum passes that you can purchase. Each one has perks, such as one hour early access, but the ZIP passes will be $15-$20, the platinum options $80-$260. General admission is $3. Are you a regular attendee who thinks the Trail of Lights is the best public holiday lights display in the country? Vote for it in USA Today’s 10Best reader poll. For more information, visit austintrailoflights.org.